What type of property will qualify for a Property Tax Funding loan? Can you help with past due taxes, interest and penalty fees as well? I have several properties. Can you make a loan for multiple properties? Do you make loans on personal property or for federal income taxes? Can I get extra cash out beyond what is owed for my property taxes? How do I apply for a loan from Property Tax Funding? What if I've had past credit problems? What materials are required for an application? What are the terms of a loan from Property Tax Funding? What is the interest rate on a loan from Property Tax Funding? How will I make my monthly payments? Can I mail my payments in directly instead of ACH? Will my property be foreclosed upon if I am late or miss a payment? Texas property tax relief loans are available for almost any type of real estate as long as the borrower is not in bankruptcy and the property is reasonably maintained. This includes residential, commercial, investment properties and vacant land. Yes, if you meet the requirements, Property Tax Funding can instantly pay your current and past due taxes including accrued interest, penalties and legal fees. We can help with you with all your properties. In certain cases, we can combine multiple properties into one loan. 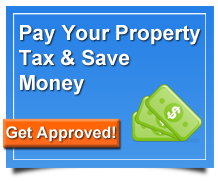 No, we handle only residential or commercial property tax loans in the State of Texas. No, by law we are restricted to granting loans only for the tax amount, penalties, interest and closing costs, including legal fees. Our application process is quick and easy. It only takes a few minutes. You can apply by calling one of our loan officers at 1-877-776-7391 or 214-550-3754. You may also submit a pre-application on our website. A loan officer will call you to complete the application at your convenience. What if I’ve had past credit problems? Credit history is typically not an issue, except in cases of current bankruptcy. Loans are approved for most applicants, even those with not so perfect credit. All loans are subject to income verification. When applying for a Texas property tax relief loan on residential property, you will need to complete the loan application form. The application will require your social security number, along with mortgage and bank information. Upon completion of this application the quick and easy loan process will begin. Your loan could be ready to schedule as early as 24 hours from the receipt of your application. Commercial applicants should have the above information available. We may also require Articles of Incorporation and the governing documents of the company. Loans from Property Tax Funding are available in 3, 5, 7, and 10 year terms. This allows you to have the flexibility you need with a payment you can afford. Our rates vary. Please contact Property Tax Funding for current loan rates. Borrowers execute an ACH agreement authorizing direct debit of their bank account. Payments are typically due on the first or fifteenth of each month. If, after executing your ACH agreement you choose to designate another bank account as the source for your payments, you must notify Property Tax Funding immediately. Yes, borrowers can choose to make their monthly payments by check or money order. Foreclosure can be initiated when a loan is delinquent. Property Tax Funding will make every attempt to work out an agreeable payment plan and in some cases restructure your loan to accommodate your needs. If default continues, a court approved foreclosure can occur to collect the outstanding debt. Yes you can pay your loan off at any time. There are no early payment penalties on residential loans. Contact our loan servicing department to receive a payoff statement.